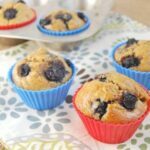 A naturally sweetend, gluten-free muffin that makes a great pre-workout snack! Combine banana, sweet potato, eggs and oil in a small bowl and mix well. Add almond meal, baking powder and cinnamon and stir until just combined. Spoon into greased muffin tins and bake at 350 degrees for 25-30 minutes.